Unique and lavish, this 5 bedroom private villa features a tranquil infinity pool, with magnificent ocean views, and majestic indoor/outdoor living areas. 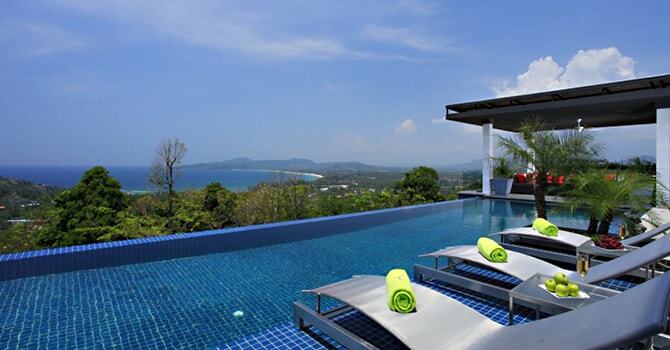 Luxury 4 Bedroom ocean-view villa near to Surin, a well planned & comfortable villa overlooking the Andaman sea. 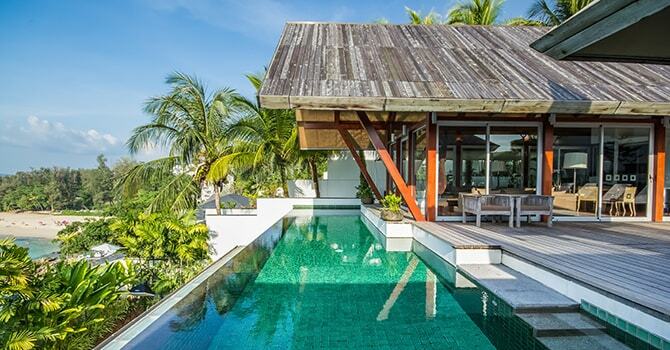 This truly stunning luxury 5 bedroom sea view villa consists of five beautifully appointed one-bedroom suites just steps from the beach in exquisite Surin. A true island gem, this luxury 4 bedroom villa features panoramic sea views and a stunning private infinity pool in gorgeous Surin. Villa Zereno is located high up in the mountains on the west coast of Phuket overlooking the sparkling blue Andaman Sea around Surin and Laguna areas. 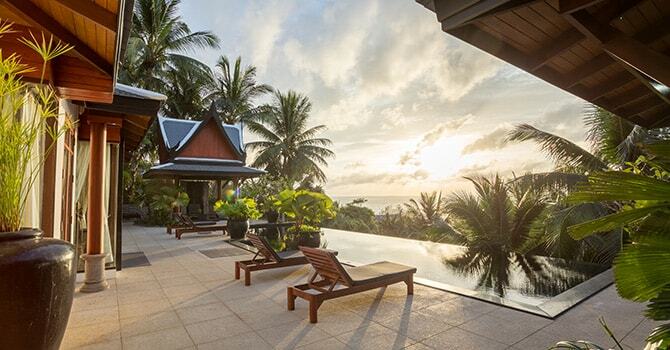 Despite its reputation as the 'millionaire's row', stunning Surin has more a laidback charm than over-the-top glamour. Join the celebrities and 1% on the long strip of white sandy beach and in the azure waters by renting one of the luxurious Surin villas and hitting the beach. Surin is located on the popular west coast, so it is conveniently located for accessing all of the popular hotspots of Phuket. To the south and not far away are the beachside areas of Kamala, Patong and Kata. Just beside Surin is the long lovely beach of Bang Tao. 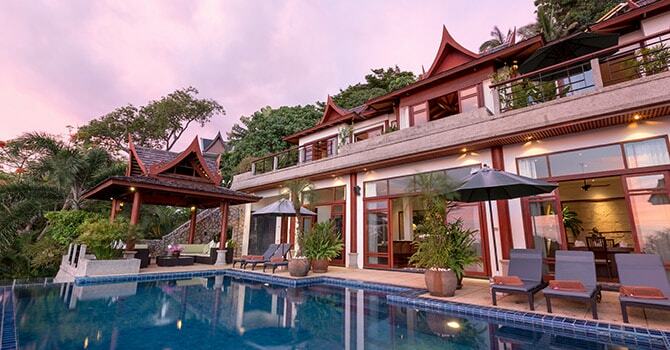 It is also conveniently located for the Phuket airport, being just a thirty minute taxi ride away. Half way to the airport, the other side of the Laguna area and it’s golf course is the quieter enclave of Layan. With it’s convenient location Surin is also quiet and peaceful, with a 'coastal village' feel more than a bustling area. The laidback, friendly atmosphere also means that Surin is popular with young families and older visitors who rent villas in Surin to enjoy the relaxed vibes. Although Surin is never too crowded, it does get quite busy in the high season. It is recommended to rent in advance to avoid any disappointment. 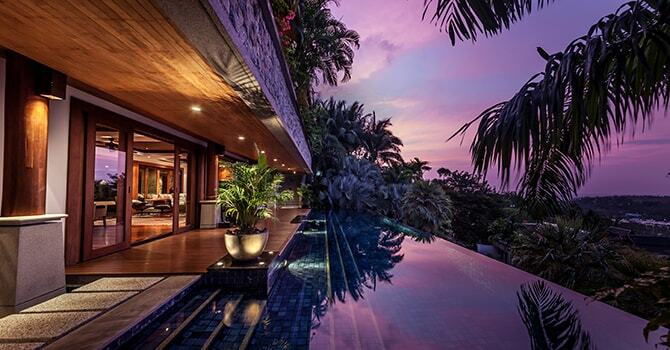 With stunning views out over the Andaman sea and a beautiful, sandy beach, it is little wonder that some of Thailand's most expensive real estate can be found in the hills above Surin Beach. The water is calm and warm, perfect for beachgoers of all ages and swimming abilities. Surin also boasts some of the best restaurants in Phuket, featuring fresh, delicious seafood prepared by excellent chefs. There are informal dining options aswell as the most famous and popular restaurants which tend to be luxurious and located within the upmarket resorts. For those wishing to learn to prepare beautiful Thai dishes in their own home, there are excellent cooking schools where you can learn to prepare delicious and traditional meals. Shopping is another popular past time in Surin, with a number of excellent, luxury shopping brands and stores. There are a number of high-quality tailors who can make beautiful, bespoke clothing, while stores like La Route de la Soie Resortwear sell stylish, luxury items that make for wonderful take homes of your time in Surin. For some more laidback shopping, drop by one of the markets located along Srisoonthorn Road. The two major ones are located near Bang Tao Mosque (Tuesdays and Fridays), and next to Lotus Tesco (Mondays and Thursdays). The markets sell a range of different items from handicrafts to fresh produce, and are a great place to see Thai life and stock up with whatever takes your fancy. Of course, the biggest drawcard of Surin is the stunning white sandy beach, with the Andaman Ocean on one side, and palm trees on the other. While the most popular beachside activity is simply soaking in the sun and enjoying the relaxing atmosphere, there are many other things to do. During your stay have a go at the popular sport of stand-up paddle boarding, a fun and relaxing way to enjoy the water. Or, grab a snorkel and keep a look out for brightly coloured tropical fish who live off of the shoreline. Surfers will also love Surin, as there are some great surf breaks all year round. Sun & Sand lovers can find beautiful accommodation near the sea, with plenty of Surin villas to rent that are within easy distance of the beach. Once the sun goes down, Surin boasts several bars and beach clubs, sip delicious tropical cocktails in elegant surrounds. If you are looking for something a little more lively then the bustling tourist center of the island is just twenty minutes away by taxi. Another must-do in Surin is to enjoy an indulgent massage with traditional oils and centuries-old techniques. There are many amazing spas in Surin, such as the Ayara Hilltops, or you can always enjoy a relaxing private massage if you are staying in one of the private Surin villas. Surin is currently undergoing a number of changes and there are plans to build a large green park for both tourists and locals to enjoy. While this remains under construction for now, there is no shortage of things to enjoy in beautiful Surin. So, make your way over to Millionaire's Row and enjoy the elegant and luxurious life on offer.